Vampire Lord appears in this card's artwork. This may be a reference to Bram Stoker's Dracula since it was described in the book that one of a vampire's many weaknesses was the mountain rose, which if placed upon a vampire's coffin could keep it imprisoned until removed. During the Standby Phase and End Phase, changing control of the equipped monster begins a chain. : With "Mark of the Rose", does the effect which changes control of the equipped monster begin a chain? 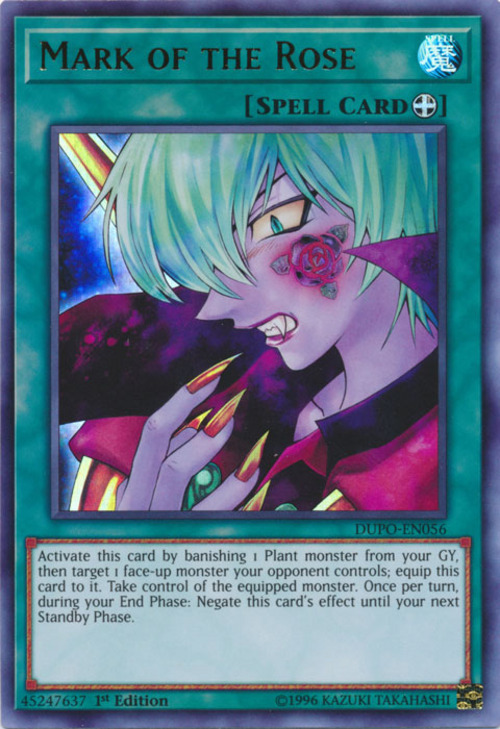 Removing 1 Plant-Type monster in your Graveyard from play is a cost. 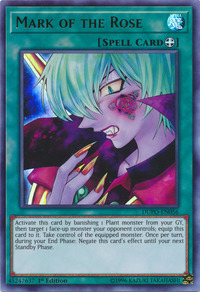 If you use "Tailor of the Fickle" to equip "Mark of the Rose" to another monster your opponent controls during their turn, you will take control of that monster after "Tailor of the Fickle" resolves. The effects of "Mark of the Rose" that activate during your Standby Phase and End Phase start a Chain.